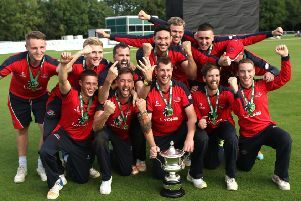 Hong Kong have drawn first blood in their two-match KPC Group T20 series against Ireland following a 40-run win at Bready on Monday. The visitors made a very competitive 169-5 as they batted first, with Nizakat Khan’s 62 and 49 from skipper Babar Hyatt the pick of their innings. Nizakat in particular looked in great touch having made a half century against William Porterfield’s team in last week’s Intercontinental Cup clash. And he scored freely here as well- hitting 7 fours and 2 sixes in his 43- ball knock that gave Hong Kong a real platform early on. Hyatt’s 49 came in good time too- 30 balls to be precise- while Ehsan Khan added 29 late on. Ireland’s bowlers struggled at times with Andy McBrine 1-22 and Jacob Mulder 1-25 faring best, although Josh Little did nothing wrong on debut either. Kevin O’Brien and Craig Young were the other wicket takers. Once they lost skipper William Porterfield as early as the second over the home side were always behind in the chase. Greg Thompson (44) and Kevin O’Brien (32) did their best to accelerate in the middle overs however some accurate bowling from Aizaz Khan (3-10), Tanvir Afzal (2-18) and Tanveer Ahmed (2-29) meant Ireland were never on top. The reply finally closed on 129 all out and Porterfield’s men will need a much improved display today if they hope to level the series. There was better news earlier on Monday for Ireland’s Women who got the better of Bangladesh in a low scoring encounter. Bangladesh were restricted to 48 for 6, but it was a real team effort from the Irish girls.